The best gift I have ever received is a pair of noise cancelling headphones. At the same time, I love my family with every fiber in my being, and am anxious to know all the details of their lives–what they are afraid of, dreaming about, and busy doing. For years, I felt that those two statements were paradoxical–that for one to be accepted, the other would need to be rejected. That was before I learned the importance of solitude. As an extrovert, I have spent the majority of my life wanting more– more conversation, more interaction, more excitement, more activity. Entering my late-forties, I have found that what I want more of is quiet–sacred space where the cacophony of voices and opinions that swirl in my head are hushed–a place where I can hear God’s whisper. This often has caused me to feel guilty– that somehow this longing is a rejection of people around me. As I’ve processed this change in me, I have been comforted by the words of C.S. 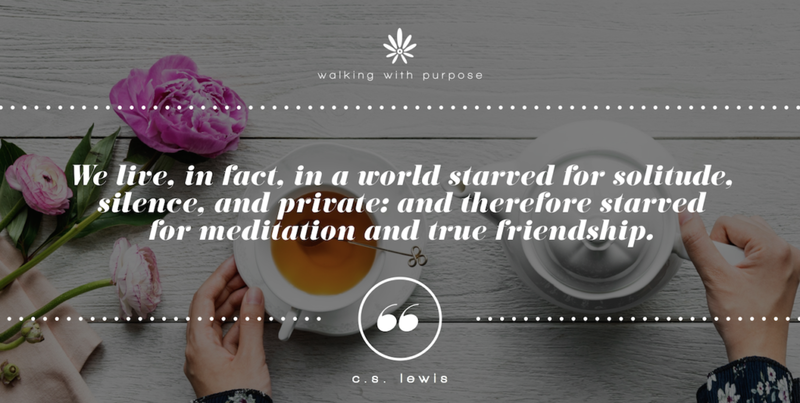 Lewis in The Weight of Glory, “We live, in fact, in a world starved for solitude, silence, and private: and therefore starved for meditation and true friendship.”(1) What an interesting thought– that without solitude and silence, we’ll have trouble experiencing true friendship with people and deep communion with God. So what happens in solitude that can be so beneficial to our relationships? It takes time alone to get to the bottom of what we are feeling and why we do what we do. When we just keep going and allow distractions to shield us from what is stirring within, we live disconnected from our hearts. This greatly increases the likelihood that we will just go through the motions in our relationships, that we will react instead of respond, and that we will make assumptions about others’ motives instead of digging deeper and asking clarifying questions. For some of us, it takes being alone to even recognize what we need. We all know the airplane rule, “Put on your own oxygen mask before helping someone else.” I know this isn’t true of everyone, but I can’t figure out how to do that unless I am by myself. When someone asks me what I need, I actually have to take a few moments to be quiet, alone, to answer that question. Unless I am by myself, I am distracted by what I think the other person might need. Someone might think that makes me a constant helper and selfless, but the truth is, when I cannot figure out what I need and ask for it before I am desperate, I am prone to acting like a martyr. This has harmed my close relationships more times than I can count, and the only one who can bring change here is me. Solitude is the place where God meets me, and He doesn’t need anything. He is my hiding place (Psalm 32:7), my refuge and shield (Psalm 119:114). He holds me in a sacred space, and invites me to reflect on the thoughts running through my head. I write the emotions down, and allow it all to pour out on paper, an uninterrupted stream of consciousness. When it’s all out of my system, the Holy Spirit leads me into truth (John 16:13), helping me to identify any hopelessness, lies, or exaggerations that have infiltrated my thinking. So that is the divine invitation–to seek out solitude, and then fill it with self-reflection in God’s presence. This is the place where we will experience real spiritual growth. No one can accompany you in those hidden moments–you must be alone–but those closest to you will benefit from them. P.S. I’ll be talking about my favorite sacred spaces and what I do when I’m there on the Walking with Purpose Instagram Stories (all week), Instagram Live (Thursday, April 12th at 12pm) and on Facebook Live (Friday, April 13th at 10am). Tune in if you want to hear more! (1) C.S. Lewis, The Weight of Glory (New York, NY: Harper Collins Publishers, 2001), 161. (2) Henri Nouwen, Making All Things New and Other Classics (London, England: Harper Collins Religious, 2000), 29.